Basic Information: What is Ped Powder Organic Foot Powder By Vertico Footwear Company? This Ped Powder Organic Foot Powder by Vertico Footwear Company review is written to assist customers decide on whether this product is the right and safe foot powder for them. The Ped Powder Organic Foot Powder uses all natural and organic ingredients to help decrease chances of any allergic reaction and prevent athlete’s foot and other fungi infections from developing. It is available for purchase from their official website, other online stores and several drug stores as well. 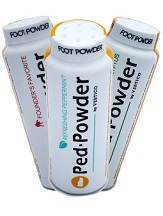 Simple to use, the Ped Powder Organic Foot Powder should be applied on the foot daily. Apply an ample amount of Ped Powder Foot Powder to the affected area and massage it thoroughly throughout your feet. Sprinkle some more powder into your socks and shoes and enjoy fresh smelling feet for the whole day. The powder not only prevents bad odor build up but also helps stops the growth of fungal infections. The Ped Powder Organic Foot Powder is priced at $9.99 for every 5 oz. bottle. It can be purchased directly from Vertico Footwear Company through their website or from other trusted online shops. It is available in peppermint and eucalyptus scented bottles. There are no known discounts at the moment but their official website offers gift certificates that you can use for discounts and other freebies from their wide selection of products. Using the Ped Powder Organic Foot Powder for a couple of months I did find that it was able to keep bad odors in check and kept my feet smelling fresh even after a whole day of hard work wearing my heavy work boots. While it did not state any time table as to when it can eliminate foot fungi, I did discover that my athlete’s foot started becoming less and less visible after 3 weeks of daily use and cleaning. Vertico Footwear Company offers returns and refunds within 30 days of receiving the item. Items to be returned must remain in mint condition as the policy states. If return of item is caused by Vertico Footwear Company’s error or arrived with damages they will issue a refund as well as pay for the return shipment. Return of funds will take about half a month to process. The Ped Powder Organic Foot Powder by Vertico Footwear Company is a relatively trusty foot deodorant that is also quite cheap. It has all natural ingredients which help decrease the chances of any negative side effects. However, it must be noted that this is mostly a foot deodorant and may not be as effective in treating fully developed fungal infection. The Ped Powder foot powder is a preventive measure for fungal infections only. As a remedy, it is not that reliable as it will have difficulty treating full blown fungal infections. Fortunately, there are other fungal treatment products that you can use if you have a serious case of infection.